As many of you will know, up until the advent of modern birds (Aves), most flying dinosaurs had teeth. Real teeth, as in little things covered in enamel and set into sockets in the jaw. Alas, however, all the toothed birds went extinct at the end of the Mesozoic, leaving only the boring old toothless birds to survive to the present day. 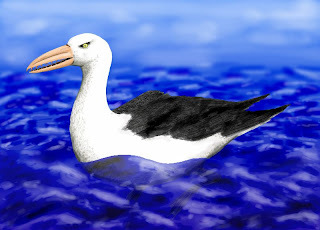 But some Cenozoic birds still were able to occupy niches left by toothed Mesozoic seabirds, and by a quirk of evolution developed "pseudoteeth" to suit this task. This group, the pelagornithids, were also among the largest flying birds that ever lived. Relatives of pelicans and boobies, these superficially albatross-like birds could grow up to 6 m in wingspan (that's 20ft for the seppos). And they were pretty recent, with the last species dying out only three million years ago or so. The "teeth" of pelagornithids were actually sharp, saw-like serrations of the beak. This week, National Geographic announced the discovery of the most complete pelagornithid skull known. It's crazy cool looking, as you can see by the photo in the link. This specimen is from about the middle of the pseudo-toothed bird era, and lived about ten million years ago (the earliest records are from 58 million years ago, showing that these birds started filling in for their toothed forebears shortly after the big extinction). The article doesn't mention if this represents a new species, so stay tuned for more pseudo-toothed goss. Image from Wikipedia of Osteodontorins by NTamura, licensed under Creative Commons Attribution 3.0 Unported.